Jan Sikes is an author who excels at writing a series of novels as standalones. The first chapter is a mixture of action and sufficient clues to fill in Luke and Darlina’s tempestuous and troubled past. Shown from both points of view, Mrs Sikes digs deep into what made the couple the people they are, and why their love has survived and grown deeper as the years pass, and their mountain of problems ever higher.Luke Stone, the wild rocker who captured the young Darlina’s heart in Flowers and Stone has turned back to the talent, and the lifestyle, he blames for causing his long prison sentence, making music. This is the story of the re-emergence of superstar, but how high can he climb before his health gives out? Beautifully illustrated, it is clear from the photographs that everlasting love is never in doubt. What a joy and what a sorrow. 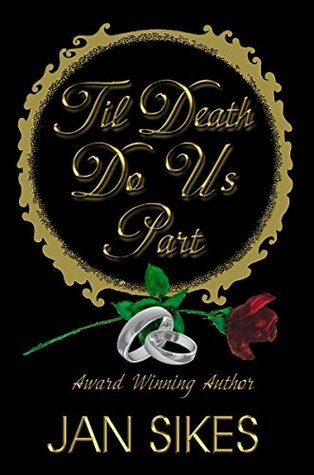 There is a gambit of emotions to be experienced in Till Death Do Us Part, the concluding chapter in the Darlina Flowers and Luke Stone series. This story of love that knows no bounds will hold you captivated from being to end. Luke embraces music again and this time Darlina joins him. There are so many good experiences in here—the musical performances, the back yard gatherings, the Saturday Store, the weddings—but there is heartache too, especially as Luke’s health declines. Perhaps that is where the love these two hold for each other resonates the strongest.Written from the heart, this is a book (and a series) that shouldn’t be missed. From hurdles to triumphs, it will make you believe in steadfast love. I had shivers about the owl hoots, especially at the end. I applaud the author for sharing her story with us and hope to see this series made into a movie someday. The final chapter of Luke Stone and Darlina Flowers brings a bittersweet story that will tug at your heartstrings. Luke's life has run the gamut. He met a love for all time in Darlina, served fifteen years in prison, endured separation and suffered such horrible health problems. He's come full circle in this book. He's back to making music and doing what fulfills him. I loved this kinder, gentler man. He's grown and discovered exactly who Luke Stone is and what he stands for. He really LIKES the man he's become. Darlina has never wavered from his side. She's been through sheer hell at times for the man she loves. Luke completes her I think. I've watched her grow through these four books and she achieved a wisdom that few people ever do. From the first chapter of this final one to the very last sentence, I was swept away into this unforgettable story. I have to say the very ending blew me away. It's beautifully written with emotion running so deep, it oozes from the pages. Luke Stone achieved everything he wanted and left a legacy that will stand forever.I love these characters who are Rick and Jan Sikes in real life. Such an amazing legacy to leave. The world will long remember the mark he left, both in music and on the people he touched. Jan writes with emotion and grit and doesn't shy away from the painful parts she lived with the rebel country singer. She, too, has left her footprints on the sands of time. This story needed to be told and she did it. I applaud her for her courage and strength. She's become a writer with an amazing gift that I really don't think she knew she had. I can't wait to see what she writes next. All I know is that she'll take her readers for a ride. So hold on tight. As the song says, " You can't keep a good man down".... That was Rick and Jan Sikes (AKA Luke and Darlina Stone, in the series.) When life gave them lemons they not only made lemonade, they made lemon cakes, lemon bars, & lemon pie. Luke's motto said it best "To do the best you can, with what you have, where you are. "This is a true story about a great man and a loving woman who survived many heartaches, tribulations, & a wonderful love story that still stands the test of time. From the Texas Honkytonks to Federal prison, from getting a second chance at life to raising a wonderful family and rediscovering the passion of his music. 'Til Death Do Us Part brings this love story full circle. He left a legacy not only for his friends and family, but for the Outlaw/Texas music industry. Like they say,"behind every good man stands a good woman", I believe this saying was truly penned, for their love story. Luke was afraid he would not leave any security behind for Darlina, oh how wrong he was, he left a lifetime of stories, music, art, and their Legacy. Jan Sikes has written the perfect autobiography. 'Til Death Do Us Part is not the final chapter in their beautiful love story, it's the beginning of the next chapter ahead. This book has moved me so much, I'm so intrigued, that I've purchased a CD of his beautiful music. As Jan hoped, this book has me wanting to reach a little higher, dream a little bigger, and love a little deeper. This is the final book in the fictionalized true-story of Luke and Darlina Stone. The story continues where it left off in “Home at Last” for Luke and Darlina. The remarkable journey of this couple comes full circle when music reenters their lives. I loved that Darlina (and their daughter) joined Luke on stage. It was beautiful to read the process of this couple creating music together. I felt every emotion reading “’Til Death Do Us Part”, especially knowing it’s the real story of the author-- and it was the last book. I was heartbroken watching the decline of Luke’s health, but was amazed, again, at how strong their love was. When I hear an owl hoot at night it will always remind me of this couple’s unwavering love. A beautifully written series I highly recommend. Jan Sikes - Jan Sikes started writing when she was a young girl, around the age of eight. Her first writing was a gospel song. She had an uncle whom she loved dearly, but he was an alcoholic and his drinking caused such family discord that at times, resulted in him being banished from their home. So, she wrote a song about Uncle Luke finding Jesus. That is her first memory of feeling the passion deep down to her toes for writing. The stories she writes (so far) are true stories about the journey of two people moving through adversity in order to grow and learn to become better humans. She believes with all her heart there is something that is worthy of sharing in these stories. Bits and pieces of wisdom, hard-learned lessons and above and beyond all, love…True love that you read about in fiction stories and yet this is truth. The old saying that truth is stranger than fiction fits the stories that she shares through her writing. She is passionate about her writing projects and is driven to tell a story with the hope that it might touch someone’s heart or life in a positive way. She also releases a music cd of original songs along with each book that fits the time period of the story. Why? Because the stories revolve and evolve around a passion for music. She is widowed, lives in North Texas, attends music festivals and has four incredible grandchildren.